Getting carpet installed is one of the last items left on the construction of your new home to prevent it from being soiled by the work crews. The carpet goes down easily, with the carpet pad installed underneath. After the carpet is laid, the carpenters will return and place the final trim along the baseboards. When choosing between having carpeted floors and hardwood floors one should consider not just the cost, but all the other factors as well. Weighing the pros and cons of each option will definitely help with the decision-making. - Cost wise, carpeted floors are a much cheaper option. - Carpets are more comfortable on the feet and this can be very advantageous for people with joints or muscle problems. - They are warmer, especially during the cold seasons as they insulate the floor. - Carpets minimize noise as they absorb sound, so they can help create a very quiet room. - For people with small children and toddlers at home, carpet is one way of baby proofing; this decreases the chance of injuries from accidents like slips and falls. - Stain is the carpet's most common enemy. Cleaning and removing stains from the carpet is a mission and sometimes impossible depending on the nature of the stain. This usually requires a lot of brushing and bleaching. 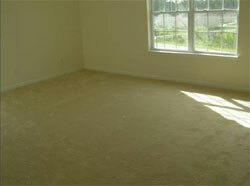 - Carpets require cleaning, vacuuming, and shampooing regularly as a part of normal maintenance. Even so, it is not possible to clean the carpets 100% because dirt will continue to build up underneath them as time progresses. - The design or pattern of the carpet also needs consideration, match designs and patterns that will go with or compliment any d�cor. You could also consult with an interior decorator regarding this matter. - Since carpets can be home to organisms like bugs and mites, it is very unlikely for carpets to last for a lifetime, as they may need replacing after a few years, because of health issues. - Carpets are not a good choice for someone who has allergies. A carpet is a magnet for allergens like pet dander, dust mites, mold and other potentially irritating proteins. Allergens provoke allergic reactions like sneezing and coughing in people with sensitive immune systems. Carpet can contain up to 100 times more allergens than hardwood flooring. - In warm places, hardwood floors offer a fresher and colder ambiance. In addition to this, air inside the room is healthier as hardwood floors are not very accommodating to pet dander, dust, dust mites, bugs and other allergens. - Hardwood flooring has a classic look and can go with any decor. - Wood floors when damaged, can be repaired by sanding and refinishing instead of having to replace them. - Stains on wood floors are easy to clean. Use common rags and towels to wipe off stains. - To maintain wood floors, it is as easy as sweeping or vacuuming followed by simple mopping afterwards. - A properly maintained hardwood will not need replacing; the lifecycle for this type of flooring is typically a lifetime. It even adds to the value of the house in the end. - One apparent disadvantage of this option is the cost. Conventionally, the price of hardwood floors together with the installation can be expensive. - Problems with noise can be an issue with hardwood floors as they do not absorb sound and sometimes even amplifies it. - Wood does not lock heat in very well. It does not provide warmth in cold weather so heaters might still be required during those times. - Because wood is of an organic nature, this is prone to natural changes. Humidity and moisture can cause wood to expand and possibly damage walls. - Hardwood flooring is also susceptible to dents, and splinters. Despite its lifetime value, hardwood may fade and lose its fine finish and therefore will need refinishing. Both carpeted and hardwood floor have their advantages and disadvantages. Depending on the circumstances, carpets can be more suitable than hardwood and vice versa. Taking time to analyze and ponder on these pros and cons rather than dealing with the matter without any acquired knowledge can be very beneficial in the end.